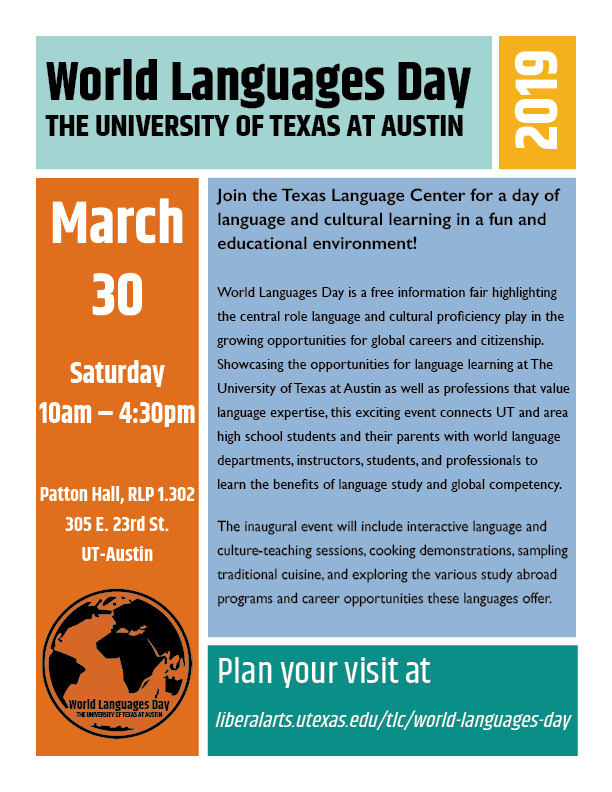 Join the TLC for the inaugural World Languages Day on Saturday, March 30! 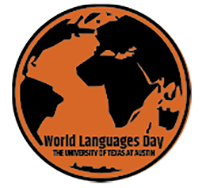 Sat, March 30, 2019 | Glickman Conference Center, RLP1.302D, E, and F Patton Hall and Winship Circle, UT-Austin 305 E. 23rd St.
Did you attend the 2019 World Languages Day? If so, please help us improve by completing this brief, 6-question survey. Join the Texas Language Center for a day of language and cultural learning in a fun and educational environment! World Languages Day is a free information fair highlighting the central role language and cultural proficiency play in the growing opportunities for global careers and citizenship. Showcasing the opportunities for language learning at The University of Texas at Austin as well as professions that value language expertise, this exciting event connects UT and area high school students and their parents with world language departments, instructors, students, and professionals to learn the benefits of language study and global competency. The inaugural event will include interactive language and culture-teaching sessions, cooking demonstrations, sampling traditional cuisine, and exploring the various study abroad programs and career opportunities these languages offer. More than 30 languages will be highlighted, including Arabic, Chinese, Czech, Danish, French, German, Hindi-Urdu, Italian, Persian, Portuguese, Russian, Spanish, and Turkish! UT visitors, please contact us if you want a parking pass! You will use the Speedway Garage, entrance is on Speedway, 2630 Speedway, Austin, TX 78712. It is about a half-mile walk from Patton Hall. Tentative schedule and parking and venue map are available on the World Languages Day webpage!